Gowalla Focusing More On Beauty With iPhone 4 — Will Users Be Attracted? As iPhone apps push out their updates to be compatible with the new iOS 4, most are focusing on adding simple fast app switching capabilities. Many are also giving their apps a quick new coat of polish to make them look a bit nicer on the new Retina display found on the iPhone 4. The location-based service Gowalla is focusing heavily on the latter. The beautiful Gowalla experience you’ve come to love has been pixel-polished for the iPhone 4’s new (unbelievable) Retina Display. This is just the first step, though. We’ll be updating Stamps, Pins, and items regularly behind-the-scenes until every bit of Gowalla truly shines. If you’re using the iPhone 4, we think you’ll be amazed. If you are using a previous iPhone or iPod Touch, though, you’ll still see the same lovely Gowalla you expect. There is no question that Gowalla’s iPhone app continues to look much nicer than the one made by main rival Foursquare. With the Retina display, Gowalla is clearly going to try to widen that gap, hoping it will help differentiate their app. But so far, the beauty advantage hasn’t helped much. After their showdown at SXSW in March (which was a pretty even fight), Foursquare appears to be growing more quickly (they did a million check-ins on July 3) and now has more funding ($21 million versus just over $10 million for Gowalla). Something else interesting in the notes of the new Gowalla app is that they say they’ve “made improvements to how Gowalla handles location.” This doesn’t appear to have anything to do with background location (at least not in the same way that Loopt is currently using it), but we’ve reached out to Gowalla to try to clarify that. One thing definitely fixed is the location issues Gowalla was having with users who updated to iOS 4. Gowalla apologized for those issues, which, in some cases, forced users to open the Maps app before Gowalla to make sure location was working). 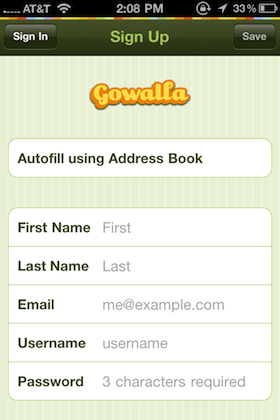 This latest version also makes it easier for new users to sign up for Gowalla right from the app. Notably, you can now pre-populate much of the data to need to fill out by selecting your entry card in your iPhone address book — it’s a nice, simple touch. You can find version 2.2 of Gowalla here. It’s a free download.